Of this chain of about one hundred islands and islets, about thirty are inhabited. The Lau Group covers a land area of 188 square miles (487 square km), and had a population of 10,683 at the most recent census in 2007. While most of the northern Lau Group are high islands of volcanic origin, those of the south are mostly carbonate low islands. 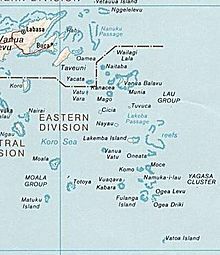 Administratively the islands belong to Lau Province.